International Journal of Research in Health Sciences,2016,4,2,43-50. 1MD Respiratory Medicine,Senior Registrar, Department of Respiratory Medicine,RBTB Hospital,NewDelhi, INDIA. 2MD Respiratory Medicine, Resident, Department of Respiratory Medicine,SAMC&PGI, Indore, Madhya Pradesh, INDIA. 3MDS Department of Prosthodontics Junior Resident,Modern Dental College, Indore, Madhya Pradesh, INDIA. 4MBBS, Junior Resident,Rajiv Gandhi Super Speciality hospital, New Delhi, INDIA. Background: Chronic obstructive pulmonary disease (COPD) is characterized by an incompletely reversible limitation in airflow. The BODE index was devised to better reflect the multisystem effects of chronic obstructive pulmonary disease (COPD), allowing for better prognostic estimation than that provided by forced expiratory volume in 1 s (FEV1) alone. The grading system, based on four parameters—that is, body mass index, airflow obstruction, Modified Medical Research Council (MMRC) dyspnea score and the 6 min walk distance—was verified by population studies. Materials and Methods: The diagnosed and undiagnosed COPD patients who visited study center for any respiratory complain and further met the inclusion criteria selected as subjects during specified schedule. A total of 100 COPD patients were randomly chosen from the outpatient department and were evaluated via FEV1% ,Six Minute walk test ,Body mass index and MMRC dyspnea score and the BODE score was calculated. Results: We found that there is an association of increasing age with higher BODE categorization.(p=0.034). 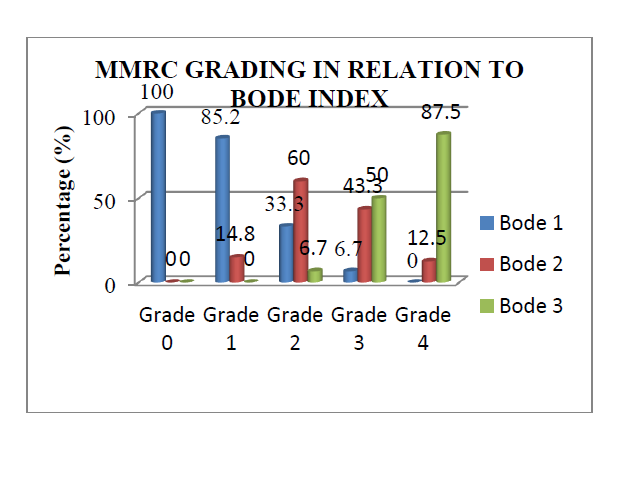 MMRC grade of the patients is significantly associated with the BODE index (p<0.001). In the MMRC Grade 4, majority of the patients were in BODE 3 index.45% patients were underweight, 41% were normal weight, 12% were overweight and 2% patients were obese. As the BODE index increases, FEV1 progressively decline. (p<0.001).There was highly significant correlation between BODE index and six minute walk distance (p=0.001). The baseline BODE index of the patients is associated with follow-up BODE index(p<0.001).The improvement in distance travelled was observed in the patients of BODE 2 and BODE 3 index with regular follow up and regular treatment. Conclusion: We believe that the BODE index is useful because it includes one domain that quantifies the degree of pulmonary impairment (FEV1), one that captures the patient’s perception of symptoms (the MMRC dyspnea scale), and two independent domains (the distance walked in six minutes and the body-mass index) that express the systemic consequences of COPD. BODE score in follow up is a powerful tool in assessing the effect of treatment and progression of the disease.